RIVERSIDE, Calif., October 29, 2018 - Bourns, Inc., a leading manufacturer and supplier of electronic components, today introduced a new line of environmental sensors based on Micro-Electro-Mechanical Systems (MEMS) technology. The initial products offered in the Bourns Precision Sensor (BPS) line are three pressure sensor model families and one humidity sensor model family. Designed for the advanced sensor needs in Industrial Automation, Energy, Building & Home Control, low/medium-risk Medical* and Mil/Aero applications, the BPS line has been designed to provide high sensitivity/accuracy, long-term reliability, high temperature capability and harsh media compatibility.SM2F-6918 Series. 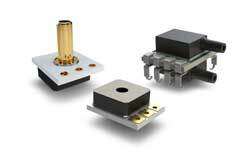 All products in the family are available now and are RoHS compliant*. For more detailed product information, please see: www.bourns.com/products/fixed-resistors/current-sense-resistors. Bourns’ new sensors feature state-of-the-art technologies that provide the ability to operate in conditions that typically cause many sensors to fail. The BPS110 and BPS120 pressure sensor models deliver extremely accurate ultra-low pressure sensing capabilities for sensitive applications. The BPS110/120 families offer fully calibrated and compensated output for more efficient processes as well as long-term stability for reliable repeatability. The Model BPS130 pressure sensor line features harsh media compatibility and high temperature operation with high accuracy. This sensor family offers particularly stable performance over the product’s lifespan, and the ability to work with a wide range of pressures. Bourns also offers port configuration and calibration customization for all three BPS pressure model families. The Model BPS230 family offers precision relative humidity sensing in a small (2.0 x 2.0 x 0.75 mm) surface mount package. Bourns’ new line of humidity sensors features low current consumption for battery supported applications and low voltage operation compatibility with high reliability over the life of the sensor.